At 5 a.m. I started up from my sleep and sat straight as a post in my bed. It was impossible to think of sleeping for a couple of hours more. 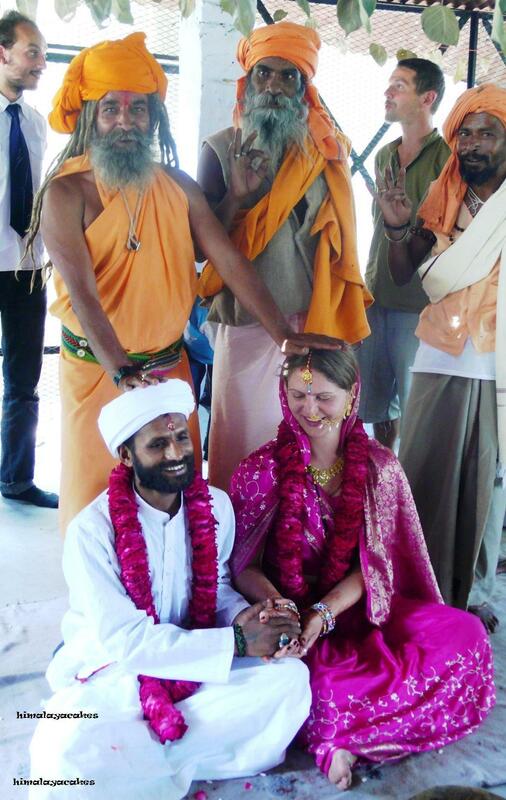 Someone had suggested a purifying morning bath in the waters of the holy Ganges before the ceremony. 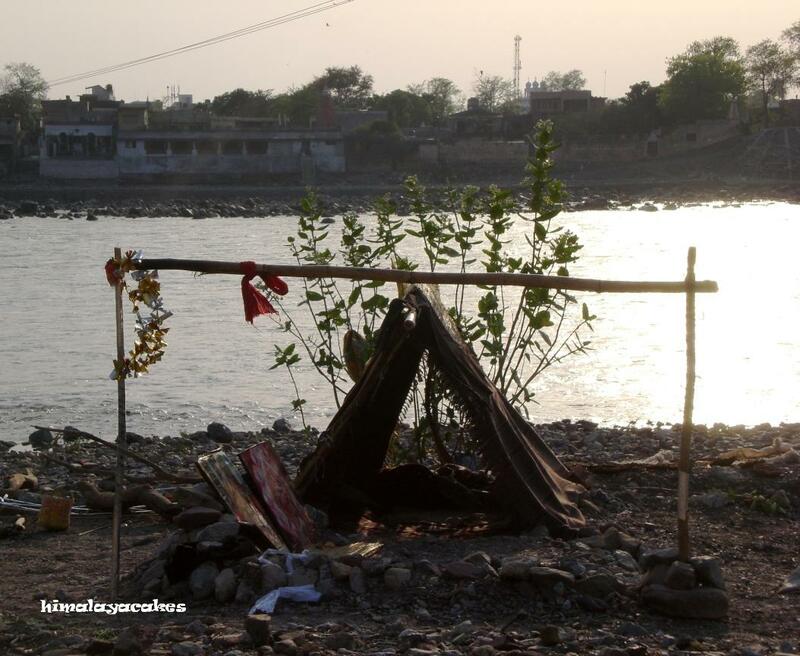 So I went to the riverbank where I found my future husband snoring soundly in Sita Ram Baba’s plastic tent. The water was in deed bitterly cold and my will was weak. I made do with sprinkling some water on my head asking for her blessings. I turned around and saw Baba sitting in the sand grinning broadly. At 8.30 my bride-manager was supposed to show up with the saree. One hour later still no sign. 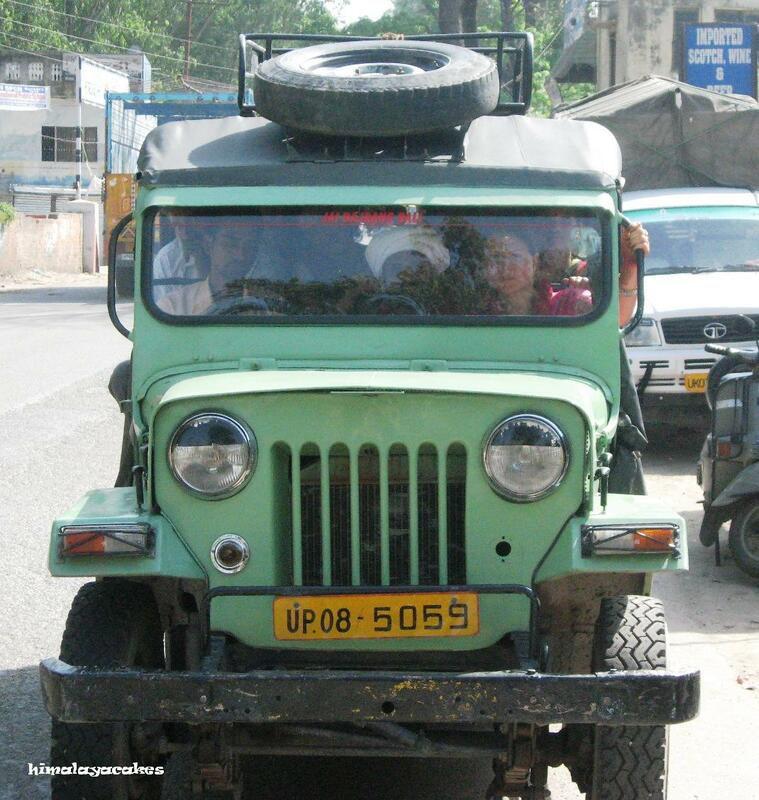 The jeeps that would bring the Wedding party to the temple in Haridwar were booked for one o’clock. 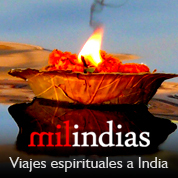 At ten, finally the saree arrived together with a good friend from Spain who I met perchance in Rishikesh. She would help with the preparations and give me some moral support. We went to the chai shop to get ready. A girl was polishing my nails, while the Indian ladies wrapped me into the pink wedding saree. The Mataji borrowed me her wedding -jewellery made of real gold that she had been wearing on her own big day. It included a bridal nose ring that would be attached to the earring by a chain. At that time I did not have my nose pierced, so we decided to simply clip it on somehow before the ceremony. When I eventually looked like an acceptable Indian bride, my electic-blue flip-flops stroke my eye. Nobody had thought about the shoes! Oh, no problem, in the temple everybody takes off the shoes anyways! My Baba appeared in the chai stall. He looked wonderful in his white kurta and lunghi! The jeeps parked in front of the chai stall; they were old army jeeps. The wedding party slowly gathered together: A handful of Sadhus and backpackers from Japan, Brazil, France, Canada, USA, Belgium and Israel. Kashi from the chai shop would be the bride’s father. The colourful potpourri of people squeezed into the jeeps and off we drove to Haridwar. The Babas were playing the dambru and everybody was singing and shouting cheerfully. The temple compound was amazingly beautiful, situated right on the shore of the Ganges. The wedding party sat down on the stone benches under the trees in the huge garden, some went bathing in the river. Someone brought snacks and soft drinks; the sadhus smoked chillum on one side and the backpackers rolled joints on the other side. I thought “Ah, this is what an Indian champagne reception looks like” …and that it was actually okay that there was no biological family present; my parents did actually not know that I was getting married. The atmosphere was pretty fun and jolly, somehow I felt more as if I was at someone’s big birthday party then being the bride on my own wedding. The local newspaper and TV channel journalists showed up. Our friend Vijay had told us that there would be one of each. Apparently they had told all of their colleagues; seven newspaper journalists and eleven TV channels had come to document the event. Good that we wanted only a humble ceremony without much fuss! What do you mean with dance? There is no music! One of the backpacker started singing “Dancing Queen” from Abba and everybody else joined in. –Hey, you! Bride! You don’t dance, stand still! My god! I wondered what the outcome of that shooting would be! My bride manager called me to put the nose ring on. She seemed a bit confused about how to do that. A discussion among the Indians started and I feared that they would pierce my nose right on the spot (in this crazy country, you never know…) finally she managed to clip it somehow on my nose. A Baba showed up with rubber flip-flops; pink colour. Great, now I had rubber flip-flops in the matching colour to my wedding dress! Sprinkle holy water here, throw flowers there, make a symbol with red colour here, stick rice on the coconut and so on; all of it at top speed. Incredible! One can not even get married in peace in this country! 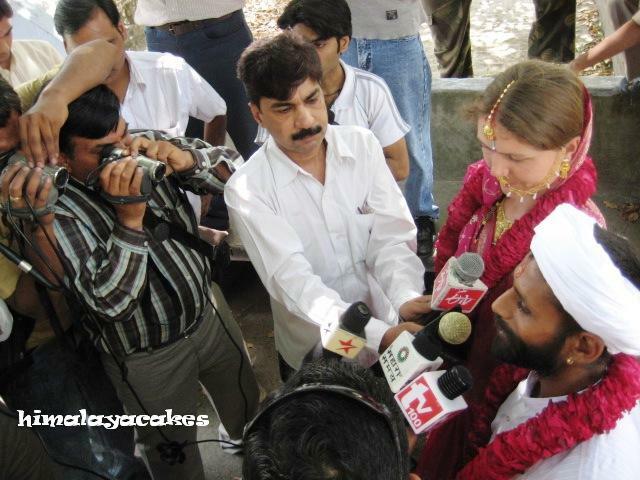 The ceremony came to an end when Baba applied the sindoor on my head and forehead. We stood up to walk seven times around the holy fire and completed the ritual by exchanging flower garlands. Someone had chased the journalists out of the temple and they were now lurking outside. Immediately they fired all kind of questions to Baba. Good! Maybe they would not pay any attention to the bride. As soon as I finished that thought all cameras turned towards me. No, I don’t. I got married that way just for fun I thought. And “PLOPP” in the same moment my clipped-on nose ring fell off. On the questions about our future plans I had to draw a blank one, as we had none. The journalist did not like that at all.